At Uncle Rooster’s in Seymour, Missouri, last week for lunch. we heartily participated in the endangerment of catfish. It is just a good thing for the ‘finny’ critters that we don’t live nearby or the catfish strips on our plates could contribute to worse than endangerment for catfish! 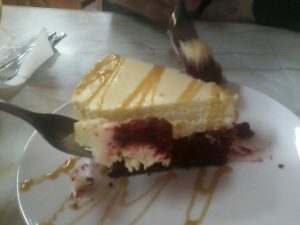 Best of all, we split a slice of the new recipe YUMMY red velvet cheesecake. (We bought another order to go — split it after the first one had some time to wear off. We chose a little drizzle of caramel topping and skipped the whipped cream. We’re never disappointed at Uncle Rooster’s. Along with the catfish strips, standard favorites for us include the special mashed potatoes and gravy, the Chicago Dog and sweet potato fries. As you pass by on Highway 60 through Seymour, Missouri, treat yourself to some very good food, excellent service and artistic desserts.